The first time I ever went snorkeling as a child, we were off the beach of Avalon, Catalina Island. The water was cold, but for these weird warm currents that flowed along the shoreline. I was convinced it was the breath of a large shark preparing to eat me. Oddly, this did not put me off the sport, and I’ve spent many dreamy hours floating face down, observing above, apart from, the world just under the surface. Maui. Hours just drifting with the currents, barely moving as I simply watched the world swirling below. Every so often, I’d raise my head to get my bearings along the shoreline. Every time, I’d find myself in a completely different place than I thought I was in. Snorkeling – such a goofy name for such a peaceful activity. A wonderland of life teeming beneath the seemingly solid surface of the sea. Sound is muted. Breathing is a calculated, in and out effort through a plastic tube. It feels unnatural, awkward. And every time you raise your head, you find that the world has moved on without you and you’re not where you thought you were. It’s been like that, the last nine months. A suspended animation of life. I floated about my days, concentrating on just doing the most basic of tasks. Work, mothering, make dinner, try to sleep. Breathe in. Breathe out. Repeat. Sleeping was the worst. I haven’t slept well in 12 years. These past months make the other 11 years look like a big long party in Slumbertown. One of the hardest things about living under the shadow of Huntington’s is the fear of being erased. I already know how hard it was to push aside the final year’s of my mother’s life and focus only on the good years. What if they can’t do it for me? What if who I am, all that I am, have accomplished, all that I’ve grown and become…what if it is all simply erased? Lost in the mire of mental illness and dementia. Karen, my mom, was never able to talk about her illness. It was the Great Unsaid. The elephant in the room we had to ignore. She was so afraid that if she acknowledged it, it would be true. It was already true, just not a truth she could ever accept. Her fear of HD was simply too great for her ever to turn and face her illness head on. I promised myself — I would be different. When I began the process of genetic counseling, I sent a quick plea to a small tribe of friends. A posse of support, some local, some going back to college days. Some who had lost a parent already, and some who I knew would just really, really pray. They provided me the buoyancy to survive the last 10 weeks of waiting. Small notes of encouragement. A text. Twelve people who knew what I was doing, what was coming, and twelve people I would have to tell when the time came. It wouldn’t be a secret. 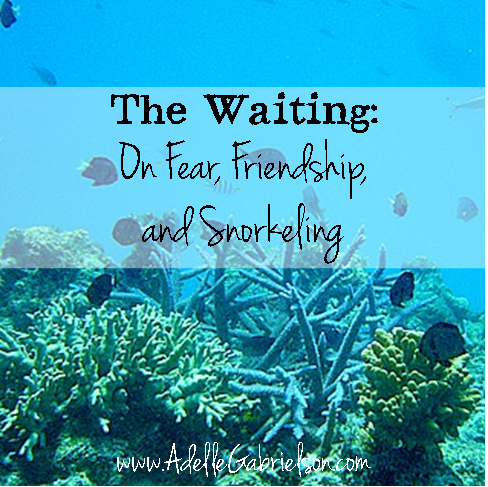 My little posse of friends kept me afloat when I could have easily drowned under the weight of waiting, anticipation and fear. Twelve people were enough to survive those nine months of abstract waiting. The shame, I come by that the old-fashioned way. I inherited it from my mother. She blamed HD for every hurtful, heedless thing her mother ever did. The thing is…there was a lot more to my grandmother than Huntington’s Disease. But it worked as an effective scapegoat for my mother, to blame all that bad behavior on an illness her mother had no control over. The flaw in the logic comes when she has to face the disease herself. If she believed that HD was the source of all horror in her own childhood, she then would have to accept that HD was wreaking the same sort of havoc on our family. She couldn’t accept that burden, she couldn’t bear the shame. So we bore it in silence, the Great Unsaid, the shame and fear unspoken. We, father, my brother and I, survived those years, but barely. Fear grows like cancer in the darkness. It is only when it’s brought out into the light that fear will shiver a bit and shrink. Still big, still scary, but smaller and more manageable somehow. I handed my fear over to 12 people I could trust. Twenty-four extra arms to carry the load, share the burden. I know they felt this nearly as much as I did. I know they ached with the uncertainty and the what-ifs. I know a few of them even laid awake at night, companions with me in the darkness, miles apart, equally praying and pleading. Please, God. Let this time be different. So grateful you had this group with you on this hard, hard journey. Are you sleeping any better since the news?? Mmmm…sort of. Some good nights, some not so good. I think I’ve forgotten how to sleep through the night…I just need more practice. And naps! : ) Thanks for asking! I am so grateful for your diagnosis. And so in awe of your determination to end the mother-child cycle of pain with you. Good for you.